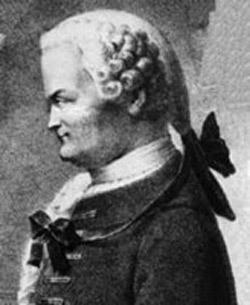 Johann Lambert was a German philosopher, described by Immanuel Kant as "the greatest genius of Germany." Lambert also ranked among the leading astronomers, mathematicians, and physicists of his day. In his Cosmological Letters (1761) he arrived, independently, at much the same conclusion as Kant and Thomas Wright, concerning the disk-shaped form of the Milky Way and the existence of external systems of stars (galaxies) throughout space. Lambert's Letters which reached a wider audience in 18th century Europe than did the works of either Wright or Kant, is also replete with the most extreme kind of speculation about extraterrestrial life. No object in the universe, as far as Lambert was concerned, is devoid of life – and life, moreover, of every conceivable kind. "The Creator," he asserts in his Letters, "... is much too efficient not to imprint life, forces and activity on each speck of dust... [I]f one is to form a correct notion of the world, one should set as a basis God's intention in its true extent to make the whole world inhabited ..." The principle of plenitude he adopts without restraint: "all possible varieties which are permitted by general laws ought to be realized ... " Yet Lambert is reasonable enough to acknowledge that he is being purely speculative: "And truly, have I not already rambled somewhat beyond the limits of what is credible? I drew conclusions. and surely enough without having in each case appropriate observational evidence on hand ..."
Like Wright and Kant, Lambert was driven to his extraterrestrial conclusions by the conviction that God, in his omnipotence, could not fail to populate every corner of the cosmos with all manner of beings. Indeed, these three pioneers of galactic and extragalactic astronomy seem to have been motivated as much by their desire to expand the number of planetary systems available for habitation as they were to populate the heavens with more stars.